Long time, no post. I was a little busy last month -- Diana took a holiday and, naturally, decided to spend it here, with me. We had a great time, mostly doing nothing, just enjoying each other's company, listening to music, watching movies, walking in the nearby park, visiting some friends, doing some shopping, taking pictures and... am I forgetting something? Ah yes, we got married! It was like one of those spontaneous Las Vegas marriages, only in Tbilisi, without getting drunk to the point of kissing the priest instead of the bride (there was no priest, no begin with), and insidiously planned in advance. 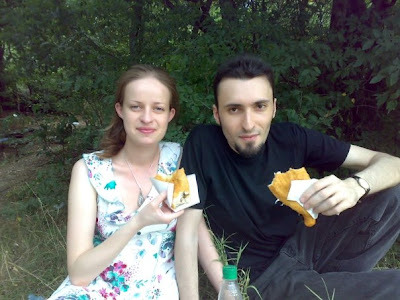 On June 18, after some epic struggle with the Eternal Guardians of the Civil Registry, which lasted for three days and three nights (actually, it took only two working days, but it's strictly off the record), we became man and wife... Okay, okay, maybe the struggle was not so epic -- I just had lost my bill of divorcement (yep, I was married before) and had to retrieve it from the dusty archives (yep, I was married in the previous century), and Diana had to have her papers re-translated from Lithuanian by a local certified translator (speaking in RPG terms, finding one turned out to be quite a side quest) -- but for us it was a real adventure, a romantic tale of registering an international civil marriage! ...OK, where were we? Ah yes, the dinner. No, forget the dinner -- there was no dinner anyway -- the marriage itself, that's the most important thing! You may ask, what's the point in being married, if you don't live together? Well, the point is... it is... okay, there's no point, actually, but it's so romantic! 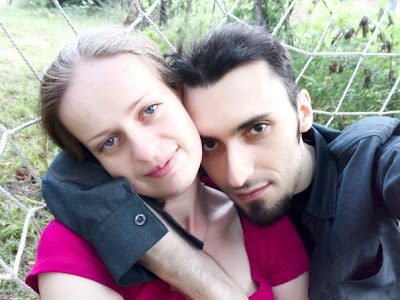 Yep, we're the most romantic married couple EVER -- I live in Tbilisi, she lives in Vilnius, we see each other mostly through our webcams, but look at this from the brighter point of view: we spend our best time with each other -- our holidays! We accumulate our passion day by day, saving it for our sweet reunions... What can be more romantic? Now seriously. Of course, we don't like living apart, and we're working on that. For now, we live between the two worlds -- Vilnius and Tbilisi, Lithuania and Georgia, her world and my world -- but these two worlds are getting closer to each other with every single day, her world becoming mine, and mine -- hers. According to the laws of the universe, someday they will merge together. How, when and where exactly, it doesn't really matter -- the most important thing is LOVE, and all the rest is just details. Now that our improvised honeymoon is over and Diana has departed, I have very busy weeks ahead. We made a plenty of photographs for many of my future projects, including the sequels to Red Bound, Crank-Up, Quagmire of Lust, Masochist, Body Language, Stairway from Heaven and many others. Also, I'm planning another trip to Vilnius next month, so I have to make some preparations. As for this semi-virtual marriage, there is nothing unexpected or hasty about it. If you trace back the history of our relationship, you'll definitely see it coming. We've known each other for five years and met in person a year ago, just to confirm that we are a perfect match. At some point we felt that the search for that special someone was over, and we were meant to be together. Of course, we don't need official papers for that, especially when we both are religious persons and regard church wedding as the only TRUE marriage, but consider this an act of commitment, a declaration of intent, if you will. There will be a real wedding, with flowers, relatives, kids from previous marriage and everything -- all in due time. That's it, folks -- just wanted to let you know, where on earth I had disappeared for the whole last month. Now you know everything and hopefully you are happy for me. Ah, and sorry for the absence of new photos -- all we have is that blurry one taken in the airport just before Diana's departure, the rest is from summer 2008, like this one, where we're eating the famous Mtskheta meatloaves. Want some? When I wake up in the morning I always think: "I'm so lucky that I met you, Rezo! And I am so happy about that :2kiss:"
სად გაქვს ნამუსი შენ, რეზო !! ნეტა ჩემიზა რატო არ გრცხვენია!